These invitations just went out the door today. They were so pretty I had to capture them before they left. Thank you spring sunshine for helping to make our silk ribbon shine. 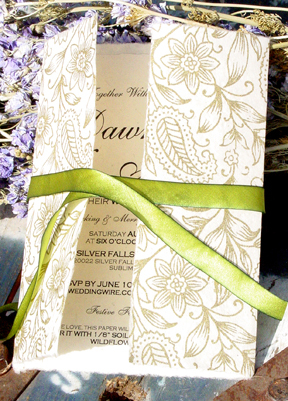 This invitation is made with our 7x10 golden garden wrap, 5x7 seed paper panel and Charm silk ribbon. Can you believe this customer spent less than $270 on her order? 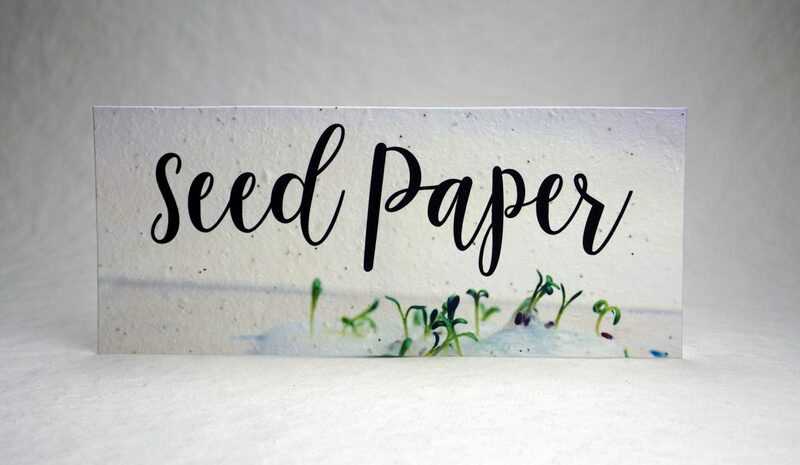 She did, for 55 handmade custom printed seed paper invitations. I printed mine in a non tranitiodal way to save money as well and everyone comments on how unique and original they are. Kudos to you on saving that way! My only warning is to keep in mind that you usually get what you pay for when you order things at a lesser cost but I say go for it. They will serve the purpose and odds are no one will even notice the difference. As for the email/phone reply it might be just as easy to use a program like Microsoft Word to print out some simple reply cards. Some people really prefer the opportunity to mail their reply over calling or emailing. Just a thought.